A dancer-friend of mine once told me that she wished someone had imparted this piece of wisdom to her when she was training: rather than eating less (as many dancers seem to do), and feeling that she had to conserve her energy and be careful about not overdoing it, wouldn’t it have made more sense to eat more and do more? Yes! In fact, that is the way to go. The question is, what to eat and do more of? That’s not what I mean though. 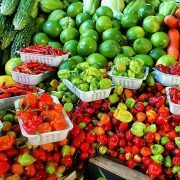 What I mean is to eat more whole foods, more REAL foods: more greens and veggies, more whole grains, more fruits, more beans. As athletes, dancers need adequate fuel, and that fuel cannot be substandard in quality. If you were taking a road trip across the country, would you fill your car with the dirtiest, cheapest gas you could find? You could, but you wouldn’t get very far and your car would be in a sad state after a few hours. It’s a crude metaphor, but the same is true for your dancing body: if you fill it with processed foods, sugar, simple carbs, and/or junk food, you’re not going to much out of it. Most dancers I have worked with tend to eat very little actual food. Instead, they exist on snack foods: pretzels, nuts, rice cakes- nibbles of finger food rather than the real deal. And they usually think that they have good energy and strength; they don’t even know what they’re missing. Once we get them on a diet of whole foods, there are some pretty exciting changes like increased energy and power reserves they never experienced before. You’ll also have energy to get through your day. It used to surprise me to hear young dancers talk about how tired they were all of the time- then I realized how little they were eating and it made perfect sense. Of course you slow down when there is no fuel in the system: your body is conserving energy. And with low/no fuel, your dancing suffers. But with a full tank of whole foods that is regularly replenished, your body will be capable of amazing things. How else do we explain marathon runners, mountain climbers, and cyclists? Are we saying that dancers aren’t capable of that level of exertion? I think not. I think most dancers can do a lot more than they think- the trouble is, without adequate fuel, you’ll never know what you’re capable of. The Nicoise Salad is composed of some of my favorite things and is a bit like small plates, which I also love. Traditionally, the Nicoise has fresh tuna atop a bed of greens, with olives, fresh tomatoes, and hard-boiled egg. Sometimes there are barely-cooked green beans as well. The other night, my husband whipped this up with a few substitutions. Whip all ingredients until combined. Taste and add more mustard or vinegar depending on how mustardy/tangy you like it. Pour over greens and toss well to coat all leaves. Also, in order to cut down on prep time, you can pre-hard boil the eggs, and toss the salad without the vinaigrette. All in all, it’s pretty quick to assemble and delicious to take it apart as you eat it. Bon appetit! Cover the pot and bring to a boil. 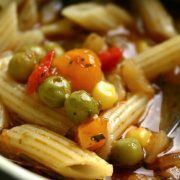 Once boiling, turn heat down to a low simmer and set the timer for 20-25 minutes- keeping it covered. Check after about 15 minutes, to be sure grains aren’t sticking to the bottom. 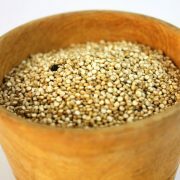 Amaranth is done when the water has been absorbed and you have a thick, viscous cereal. It has a particular taste even before adding nuts and berries, so give it a try and see what you think. I like it sweet, but it can also be made savory if that’s your thing. Amaranth is tasty reheated as well; just stick it in the microwave with a few drops of water on it to remoisten or heat it over low heat on the stovetop. If you like variety, add fruit and nuts only to the bowl you’re eating so that what you put in the fridge is plain and can be flavored differently later on. If you make a large enough pot, you’ll have enough for two or three breakfasts or afternoon snacks. Keep those bones dense and strong! 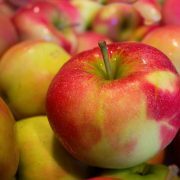 In winter time, I tend to eat a lot of apples: they are one of the only fruits still available at the farmer’s market and are so versatile. Today, I’m giving you three ideas of how to get your apple a day. All are simple, fast, healthy, and delicious. Sliced apple with nut butter: one of my go-tos, this has been made even easier to prepare thanks to single serving packets of nut butters like these from Justin’s. Mix it up by trying different types like almond or cashew butter. (Try to limit butters with added sugar.) Make it simpler by using an apple slicer/corer like this. If prepping the apples at home, dump slices into a tupperware or ziploc bag, and then toss in a teaspoon of lemon juice to keep apples from turning brown. This is a great energy snack: carbs plus protein. Sliced apples with lemon and black pepper: I know, it sounds odd, but it is 100% delicious. A friend’s mom served this as a snack before Thanksgiving dinner and it was perfectly refreshing. Prep apples same as above, put into the bag/container with lemon juice and then add freshly ground black pepper. Try it first; judge second. Homemade applesauce: Don’t worry if you’ve never made this before- it couldn’t be easier. Chop apples into chunks- I like to leave the skin on because it gives the sauce a nice color. I also use different types of apples to increase the flavor. Toss all apples into a pot. Add 2 inches of water. Add ground cinnamon and cloves. Cover with lid and turn heat to medium-low. Cook for between 20 and 45 minutes, checking apples every 10 minutes or so; give them a good stir to rotate the cooked ones to the top. Depending on how mushy or chunky you like your applesauce, you can start smushing it with your spoon or let it stay chunky. Taste and add cinnamon and clove until it’s the way you like it. No, you do not need to add sugar! (Or butter.) Really, apples are very sweet, especially when cooked down. I have served this to a lot of different people and all of them have remarked on how sweet it is. They never believe me when I tell them there’s no added sugar. This is a great dessert – try having it after dinner to satisfy your sweet tooth. On these cold winter nights, a bowl of steaming soup is a great way to warm up and get your nutrients. 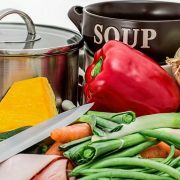 Soup is easy to cook and it lasts- make a big pot that you can reheat during the week, or freeze in single serving containers for a quick meal later on. (This is especially good for evenings when you are hungry for something healthy, but are too tired to cook.) Add beans for a protein boost, ribbon-cut leafy greens for vitamins, and a Tablespoon of turmeric for anti-inflammatory properties. 1 teaspoon each of dried herbs: oregano, basil, tarragon, etc. Optional: tablespoon of basil pesto. Heat the carrot, onion, and celery over low heat in 1 Tablespoon of olive oil. When tender, add dried herbs (if you like them! ): oregano, basil, tarragon are my go-tos. Stir until herbs become fragrant. Then add broth and tomato puree and beans. Bring to a boil, then simmer for 15 mins. Add cubed zucchini and collard greens. Simmer for 10 mins. Salt and pepper to taste. If you like pesto, adding a Tablespoon to this soup will add a rich flavor. Serve with a sprinkling of grated parmigiano cheese on top. 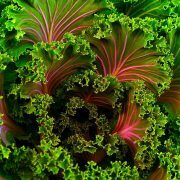 ** To cut leafy greens into ribbons, simply place two leaves together, roll like a cigar, and then cut thin strips through the rolled cigar. If ribbons are too long for your taste, cut the big leaves in half lengthwise before you roll them. 1. Two-thumbs-up for the shift away from telling “heavier” dancers to stop eating, and instead directing them to company resources like nutritionists. “You still have to be quite skinny and you have to have long, lean muscle. There’s no getting away from that. Ballet is all about aesthetics,” says Marr. I know this, but it still pains me. So, dancers don’t have to eat “inordinate amounts” of food to get the energy they need? Problems: 1) “inordinate” is too subjective: what does that mean, exactly? and 2) everyone is different. While Marr may not need to eat a lot, that generalization shouldn’t be applied to all dancers. Furthermore, many dancers do lower their overall caloric intake in order to achieve the proper look. By the time they become professionals, they are so used to eating that way it may feel totally normal. It doesn’t change the fact that compared to an average person, dancers eat considerably less food. 5. And, finally, two thumbs up for proper screening. That neither Marr nor Lawrence have faced issues around their weight at BRB made me think about the selection process. Most companies have a rigorous screening process wherein dancers who do not fit the aesthetic of the company are not usually hired. I used to think this was terrible, but I have come around to understanding the potential good of this practice. If a company has a strict aesthetic, then I think it’s correct that they screen and hire appropriately. Is there anything more disheartening than landing the much-coveted contract, only to be told you must lose weight? Until the ballet aesthetic changes worldwide, dancers should not be hired at one weight on the condition that they drop to another before they are considered stage-worthy. Surely, this practice leads to a greater number of physical and psychological problems. Ultimately, I like to think the ballet world will be forced to alter its aesthetic to accept more “normal”-sized dancers. But until then, it seems imperative to not put dancers in the position of having to lose weight in order to keep their jobs, which is why being particular about the aesthetic right out of the gate seems like a better choice to me. But enough of what I thought. What was your impression of the article? I am the first to admit that eating a cold green salad in the heart of winter can be a challenge if your body craves warm and hearty foods like mine does. That said, greens are always in order, no matter the season, so it’s time to get creative. This recipe calls for arugula, a bitter, dry green which pairs well with olive oil and parmigiano cheese. A lot of brands carry arugula in those plastic boxes, already washed. 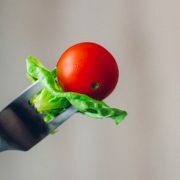 This is one of those “cheats” that I support- anything that gets your meal to you faster without compromising your health! 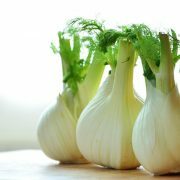 The recipe also calls for fennel, a bulbous, white, crunchy vegetable that grows in the ground. If you’ve never had fennel before, give it a try; it tastes a bit like licorice, and is crisp and fresh-tasting. In fact, in Italy, a slice of fennel is often served at the end of a meal to refresh your palate before moving on to dessert. It’s also healthy, delivering 17% of your recommended daily amount of Vitamin C and 10% of your Potassium. If you like shopping at your local farmer’s market, which I highly recommend, this salad makes use of ingredients you can find in late fall. If you’re a supermarket-goer, you shouldn’t have any trouble finding arugula or fennel year-round. Mix these ingredients, then toss with olive oil, fresh lemon juice, salt and pepper. The peppery, bitterness of the arugula is nicely offset by the parmigiano cheese, which also adds saltiness. I think the freshness of the fennel is what makes this salad so healthy-tasting. It’s also light, which is great for in between classes or rehearsals, and late at night when you need something but don’t want to fill yourself too much. This post was originally published on Beyond the Gold– NY International Ballet Competition’s blog. It’s on how you can cook and eat homemade meals all week without spending your life in the kitchen. It’s easier than you might think….! I happen to love the phrase, “Cook once, eat twice.” But in my kitchen, it’s cook once, eat four or five times. I love to eat well, but I am not willing to spend a lot of time cooking during the week unless it’s a family event. So, here are some of my tips for cooking/prepping once and eating many times- these are very simple ideas, but I hope they get you thinking! I usually pick a day when I cook three or four main ingredients and then have them in the fridge as building blocks for the week. My trick is that I cook them in the simplest way possible, usually steaming for veggies and greens and basic prep (without flavoring) for beans and grains. That way, every time I eat, I can add different flavors to create a whole new dish. Cannellini beans: soaked for 24 hours, then boiled until soft. In addition to these simple ideas, you now have a green, a grain and a protein, all ready to be eaten in any other creative way you want. Brown rice is a great staple to include in your dancing diet for a number of reasons. It’s a whole grain, meaning it has all of its bran layer intact, so it’s full of vital nutrients. Brown rice has more vitamin B than any other grain; it also contains iron, vitamin E, and amino acids, among other nutrients. It’s high in fiber (good for you) and made up of 80% complex carbohydrates, so it burns slower than white rice, giving you longer-lasting energy. After chopping and rinsing the broccoli, steam for 5 minutes in a steamer, or boil in water; drain. Place in bowl. Add 3/4- 1 cup brown rice. Toss with a squirt of lemon juice, a drizzle of olive oil (omega-3 fatty acids), and salt and pepper. This is a light lunch between classes and rehearsals as well as a tasty, easy-to-throw-together dinner. And of course, once you’ve got the huge pot of rice, you can get creative about ways to spice it up. 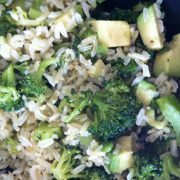 To get you started here are some simple recipes to try mixing with your rice. 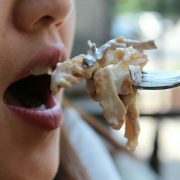 A can of tuna fish, black olives and capers. The combinations are endless and so easy to do once you have your base. Dig in! *New Note: as of 2012, brown rice has been found to have higher than normal levels of arsenic in it, thanks to the soil and water in which it has been grown. Read this Consumer Reports article for the full story. I know, right, another toxic thing to have to worry about! You can still eat brown rice. The report recommends brown basmati from California, India, or Pakistan. “It has about a third less inorganic arsenic than other brown rices.” They recommend no more than 3 servings per week. So maybe make a slightly smaller pot or consider trying some of the whole grains that are naturally lower in arsenic like quinoa, millet, and white basmati. You'll receive a notification and link each time we publish a new article. Coffee & Caffeine: Where Do You Stand?